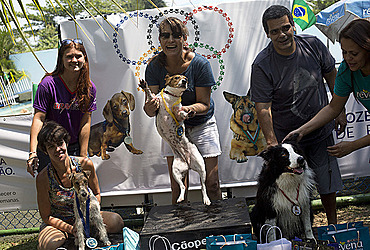 RIO DE JANEIRO (AP) — Man's best friends and their owners have embraced the Olympic spirit by taking part in Brazil's first Dog Olympic Games. Dogs of all breeds, ages and sizes competed for medals in diving, jumping, swimming and running at Toto's Park Club in the Rio de Janeiro neighborhood of Barra da Tijuca. A 9-month-old beagle named Mima took home the gold medal in aquatic jumping. Mima's owner, Aura Stella, said, "I didn't even know she had all this talent." Sunday's event coincided with the final day of the Paralympic Games in Rio.